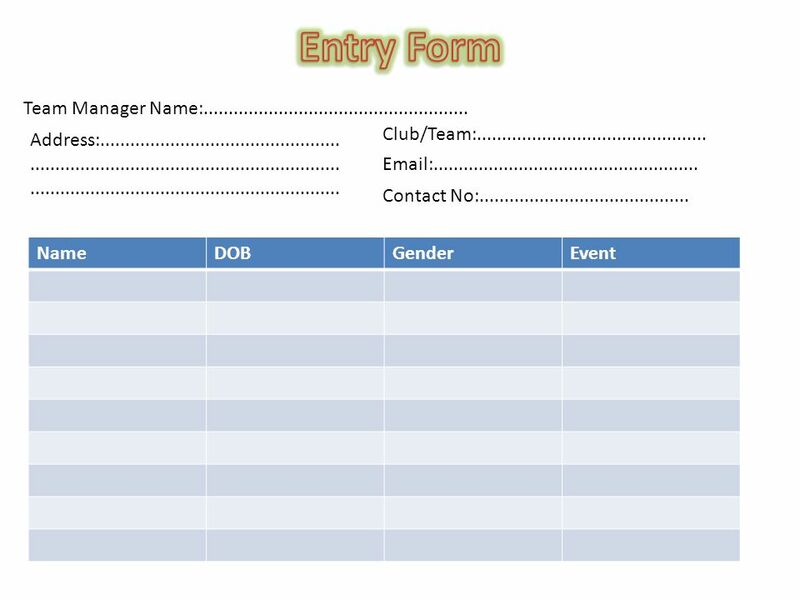 4 NameDOBGenderTeam Event As team manger I agree to the terms and conditions of the event and have filled in the correct information for all competitors racing in the event. Signed:............................................. Date:..................................................... Please send all entries to Kierancahill@bexhillcollege.ac.uk or Kieran Cahill, Bexhill College, Penland Road, Bexhill On Sea, East Sussex, TN40 2JG. 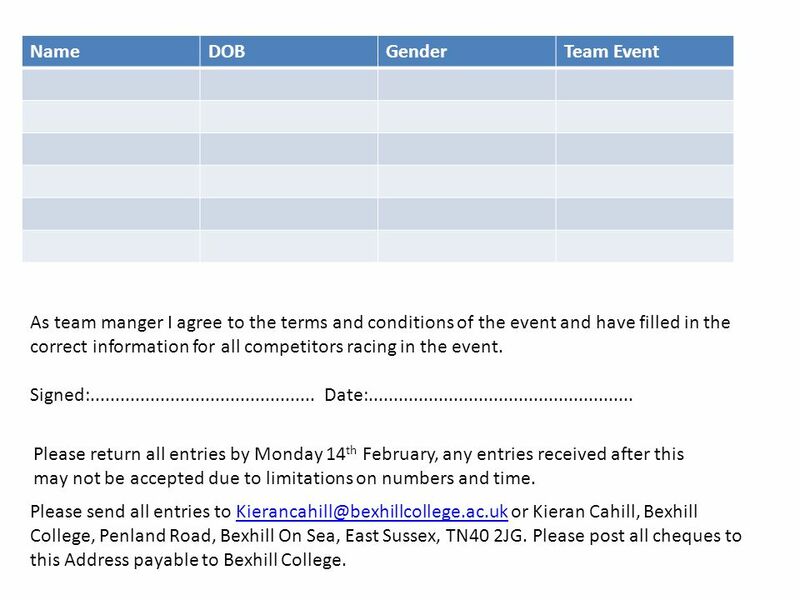 Please post all cheques to this Address payable to Bexhill College.Kierancahill@bexhillcollege.ac.uk Please return all entries by Monday 14 th February, any entries received after this may not be accepted due to limitations on numbers and time. 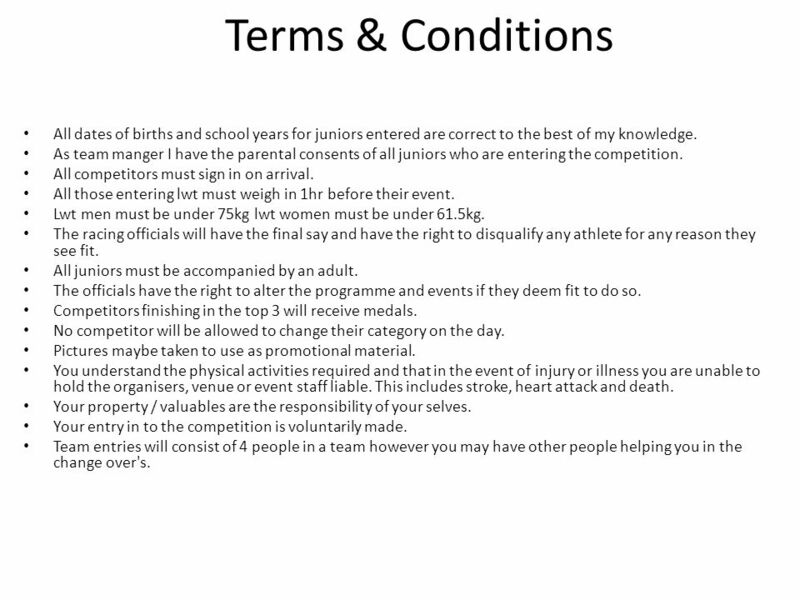 5 Terms & Conditions All dates of births and school years for juniors entered are correct to the best of my knowledge. As team manger I have the parental consents of all juniors who are entering the competition. All competitors must sign in on arrival. All those entering lwt must weigh in 1hr before their event. Lwt men must be under 75kg lwt women must be under 61.5kg. The racing officials will have the final say and have the right to disqualify any athlete for any reason they see fit. All juniors must be accompanied by an adult. The officials have the right to alter the programme and events if they deem fit to do so. Competitors finishing in the top 3 will receive medals. No competitor will be allowed to change their category on the day. Pictures maybe taken to use as promotional material. You understand the physical activities required and that in the event of injury or illness you are unable to hold the organisers, venue or event staff liable. This includes stroke, heart attack and death. Your property / valuables are the responsibility of your selves. Your entry in to the competition is voluntarily made. 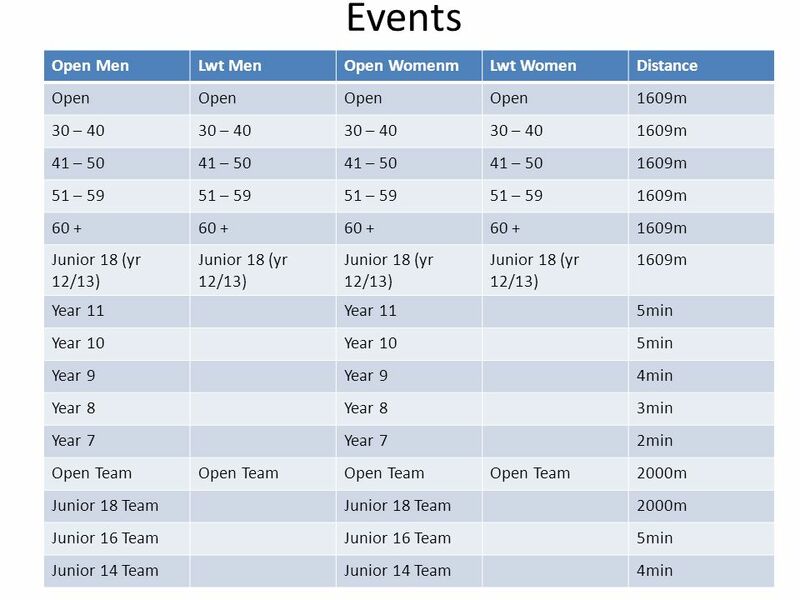 Team entries will consist of 4 people in a team however you may have other people helping you in the change over's. 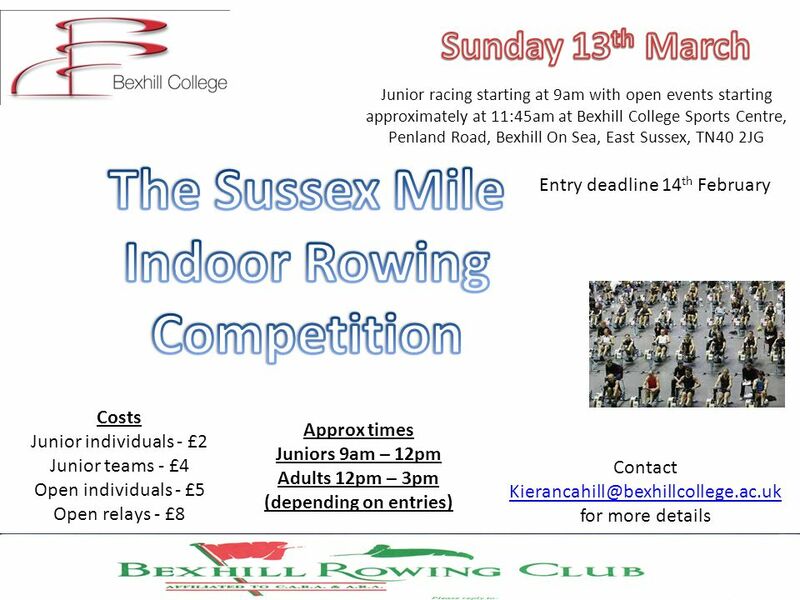 Download ppt "Junior racing starting at 9am with open events starting approximately at 11:45am at Bexhill College Sports Centre, Penland Road, Bexhill On Sea, East Sussex,"